Info I CAN'T SEE! Screw the lightbulb back in! 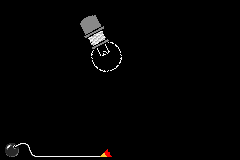 Bright Idea is one of Jimmy T.'s microgames in WarioWare: Twisted! The objective of this game is to screw a light bulb to turn it on. If done so, the player wins. If the time is up and the light bulb is not on, they lose. 1st level difficulty: The light bulb's head is small. A cat about to eat the last fish shows up. 2nd level difficulty: The light bulb's head is a bit bigger. A man in a costume who's sweating shows up. 3rd level difficulty: The light bulb's head is bigger. A woman who kisses the player shows up. This page was last edited on September 27, 2018, at 18:44.